Doctor Who: THE NINTH DOCTOR #8 Review | Warped Factor - Words in the Key of Geek. Tony’s doing the monster mash. The Ninth Doctor was a Time Lord unlike any of his previous selves in the Classic era. We were then years away from the invention and jamming into the mythos of the War Doctor, but right from the beginning, Russell T Davies’ vision of the Ninth Doctor was of a man scarred by his experiences in a great and terrible war. His people, for all their stupid hats and pomposity, were gone. His planet, gone. He was a man who’d done things his predecessors would never have dared to dream of, a man responsible at least in part for the genocide of the Daleks and the Time Lords both. The whole arc of the Ninth Doctor’s TV run was his healing, his learning what it was to be the Doctor again through the wonder, the bravery and the compassion of a young human named Rose Tyler. Like a shell-shocked soldier brought back to life by the wide-eyed enthusiasm of his granddaughter, little by little, the Ninth Doctor remembered to act in a way that he could, rather than in a way he felt he had to, just to survive in a harsh universe. We say all of this because one of the most touching, heart-wrenching moments in issue #8 has the Ninth Doctor talking to an old, old friend, and they notice the difference in him to how he used to be in his Classic era days. It’s not that he’s not still brave and brilliant, he is – it’s that he’s gained the calculating objectivity of a commanding officer, sending others into necessary danger, where previously, he would have sought to keep them safe, almost wrapped in cotton wool, and embraced the personal danger himself. That’s the Ninth Doctor – willing and able to see his companions more as operatives, as grown-ups in their own right, with skills of their own, that can help him win, because winning is the right thing to do. 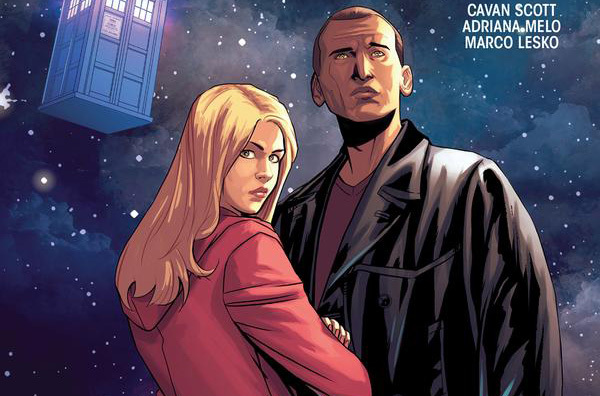 Issue #8 closes out a nostalgic story that has taken the Ninth Doctor back into his own timeline, even if it’s a little beyond the point at which he’s likely to bump into himself. It’s been a story of make-believe monsters, real old friends, real new friends, and the culture shock of seeing New Who and Classic Who collide. But it’s also been a story of corporate and personal cynicism and greed versus international co-operation, which makes it a story for our time. In fact, that’s perhaps what makes it a story more of our time than at any point since the Eighties – the battle for hearts and minds, and then battle for ownership of vital services between the forces of corporate exploitation and the forces of public service hasn’t been as sharp at any point since the 80s as it is right now, which allows Cavan Scott’s story to work both in terms of the audience to which it’s currently speaking, and the reality of the times in which it’s set. When a private company wants to establish itself as the go-to force for protection against alien menaces, there’s little doubt in this story that it would resort to creating controllable menaces against which it can be triumphant, whereas when national and international forces that serve the public have to fight against alien menaces, they have to fight against them, and they’re not about to create more just to make themselves look good, to secure contracts, or to goose the bottom line. This is Scott embracing the occasionally socio-political crusading tone of Who, to show us why, for instance, it’s a conflict of interest for Presidents to keep lines of close communication with their business interests while in office, or why, for instance, healthcare, education and police forces should not be subject to the unpredictability of the market, or the whims of those whose primary concern is making a profit. The conclusion to the story is fairly workaday, Rose pulling the old-fashioned ‘secret microphone’ trick on some of the baddies, while the Doctor and his earlier friends find a way of generating the monsters themselves, while sending an undercover operative to blow the greedy corporatists’ plans to smithereens by going public with them. But this issue’s not really about the nuts and bolts of foiling the villains – there are, as the Ninth Doctor would probably admit, about six different ways to foil the villains in this story. This issue, and this storyline, is about bringing the old and the new together, having them work out their differences and their similarities, save a family that’s being mercilessly exploited for corporate gain, and show how much has happened to the Doctor since his Classic era days, how much it’s changed him, and how much he relies on his friends, more now than ever, to help him do the right thing. While Scott’s story is both politically en pointe and emotionally heartwarming, issue #8 is less than perfect. Adriano Melo on artwork, while clearly able to render the world in engaging detail – the monsters here are precisely drawn and rendered – takes one or two too many shortcuts in some of the characters in this issue. Some, including major figures like the Doctor and Jack, are occasionally rendered as little more than stick figures, notional placeholders for what feel like the finished characters. The effect becomes distracting after a while, as though the issue was rushed to print before the artwork was completed. While it doesn’t ultimately stop issue #8 being a great conclusion to a nostalgic but modern adventure, it’s an awkward, somewhat ill-fitting element in the issue that stops it being as engaging as it would otherwise be. 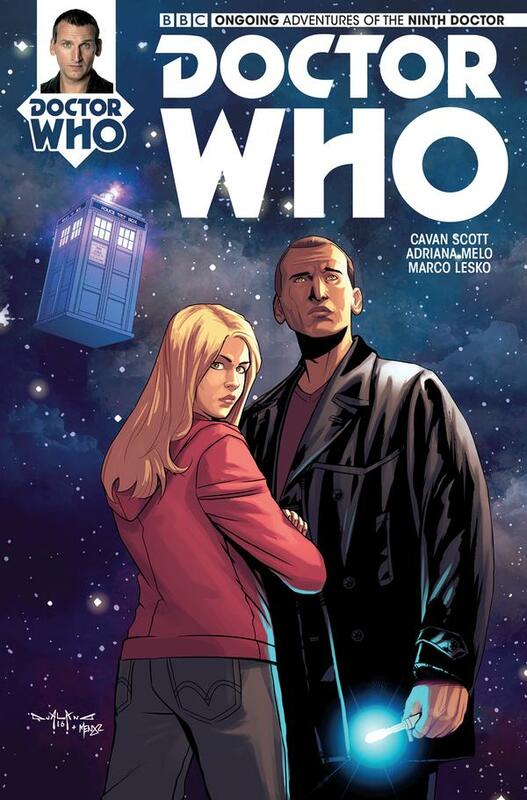 Issue #8 of the Ninth Doctor’s adventures is a highly competent end to a solid story that blends the best of both Classic and New Who worlds, and in a couple of scenes in particular, it goes straight to the often-unseen heart of the Ninth Doctor, in a way only friends far older than Rose and pre-immortality Jack can do.